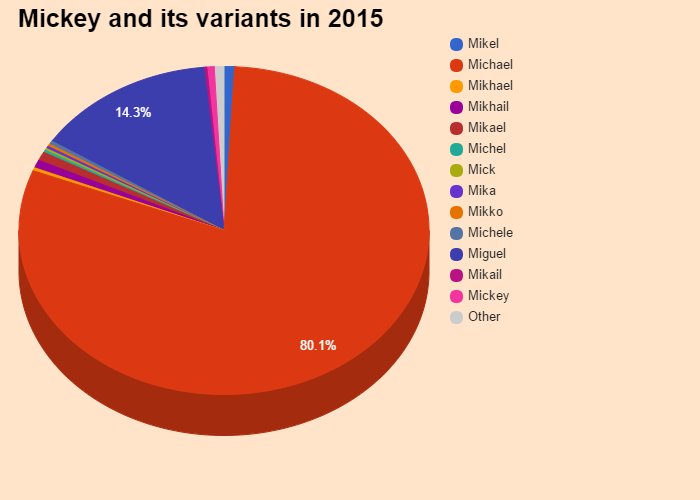 Mickey was ranked 829 in 2015 list of US boys name and dropped by 0.24% from its previous ranking of 827 in 2014. Mickey was ranked 958 in 2015 list of US girls name and dropped by 0.63% from its previous ranking of 952 in 2014. Anglo-Saxon form of Michel. Comes from the Hebrew "mid-kha-El" Means: "Who is like God" in celebration Sept. 29.. These are hard and daredevils. Good living, moreover strong sympathetic,Mickeyoften surround many friends. On the open and welcoming spirit,Mickeyalso know preserve their secret garden. Cunning, morals change frequently depending on their interests. Mickey are quite authoritarian and like to order. Few patients,Mickeysometimes lack diplomacy. Careless,Mickeytrust life and luck. Mickey is a rare first name for a boy in England & Wales which is a rare name since 1996 and ranked 1117 in 2014. Only 232 people have Mickey as their first name. Mickey is a very consistent name over the past 18 years. Mickey is a very very popular first name for a boy in United States which is popular since 1940 and ranked 829 (0.002574% bearer) in 2015 in US. Around 33075 people wear Mickey as their first name. Mickey is a rare first name for a boy in United States which is a rare name since 1898 and ranked 829 (0.002574% bearer) in 2015 in US. Only 33075 people have Mickey as their first name. Mickey is not a native United States and Mickey may be came from another language or is a short form of some other name. 0.009252% of people in US have this given name. Expression number of Mickey is 3. Mickey are lively, imaginative, enthusiastic and optimistic. Mickey are expressive and inspire others wherever they go. Mickey possess great verbal skills which make them good comedian, artist or writer. Mickey Baker MacHouston Baker, known as Mickey Baker and Mickey "Guitar" Baker, was an American guitarist. Get the meaning of Mickey and celebrities who also shares the same name and some names related to Mickey, english baby names list, list of names in english. Know what does Mickey mean? This website serves as the extended english names list which will help in naming your child.